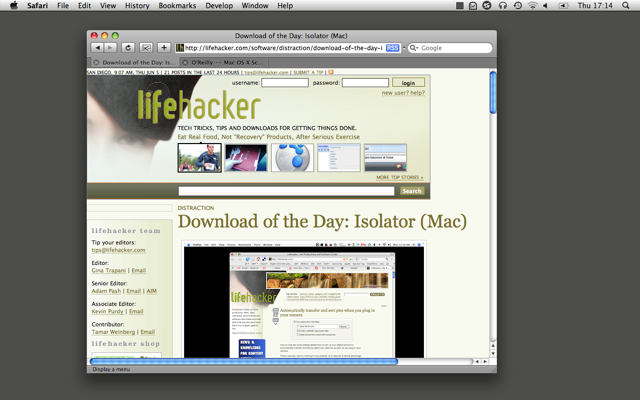 Install Isolator by mounting the disk image and dragging Isolator to the Applications folder. Stay up to date by subscribing to RSS appcasts for stable versions only or all new versions (including betas). Start Isolator by double-clicking it in your Applications folder. It will install a small square icon in your menu bar. To turn Isolator on, click on the menu bar icon and select 'Turn Isolator On' from the menu that appears. You can turn it off the same way. Alternatively, you can press 'shift-command-i' to turn it on and off. You can always access the Preferences (even if you've disabled the menu icon) using the hotkey 'shift-command-option-i'. And, if you customized Isolator so that left-clicking the menu icon activates Isolator, you can still get to the menu using right-click or control-click. Can Isolator cover up or dim the menu bar? No, this is only possible using dodgy techniques. This feature won't be added to Isolator. Quit Terminal and restart Isolator. To undo this later, do the same but with 0 instead of 1. See the Core Image Reference for details of the filters you can use, but many don't work well in this situation. If you experience a crash when using the Preferences window, it is because your preferences have become corrupt. Please send me a copy of the file ~/Library/Preferences/eu.willmore.Isolator.plist so I can debug the problem. Then delete your own copy. You'll have to set up your preferences again from scratch. There are some glitches with when Exposé and Spaces are used. Bug reports, suggestions, etc to bdeb at willmore dot eu. If you like Isolator, please consider donating a few dollars. Donations are greatly appreciated!